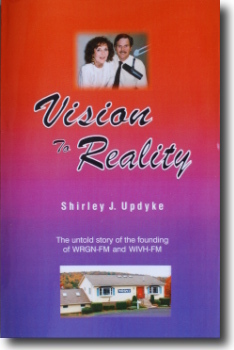 This book chronicles twenty-five years of Christian radio boradcasting over WRGN and WIVH. Readers learn how the stations were established and the commitment required of two people to keep them filling the airwaves with a voice of hope for Northeastern Pennsylvania and the Virgin Islands. It tells how a dream and desire to serve God grew into a ministry supported and encouraged by thousands of faithful listeners. "Reading 'Vision To Reality' is like finding god's fingerprints on a long-term ministry. Every step of the way, God was involved in this dream that has touched so many lives. I'm please to recommend this year by year retrospective of a vibrant ministry. Bravo, Shirley!" - Chris Fabry, author and radio host. "From a whisper to a shout. From a dream to reality. From impossible to possible. The Updyke have seen it all. This is a primer on how to do great things for God. Talk about 'Going Beyond The Call,' they are the living examples. What a fun and amazing read!" - Ron Cline, HCJB Global, host of "Going Beyond The Call." To get your copy, simply call 1-800-245-3688. Or click "Contact" in the menu above. Fill out the form and make sure you mention that you want a copy of "Vision To Reality." The price is $16.95 plus tax and postage. Vision To Reality, published 2009. (c) 2010 Gospel Media Institute. Free CSS Templates. Media Attribution.